A rare yellow lobster finds new lease on life at the Aquarium. The American lobster (Homarus americanus) was generously donated by Patriot Seafoods of Salem. 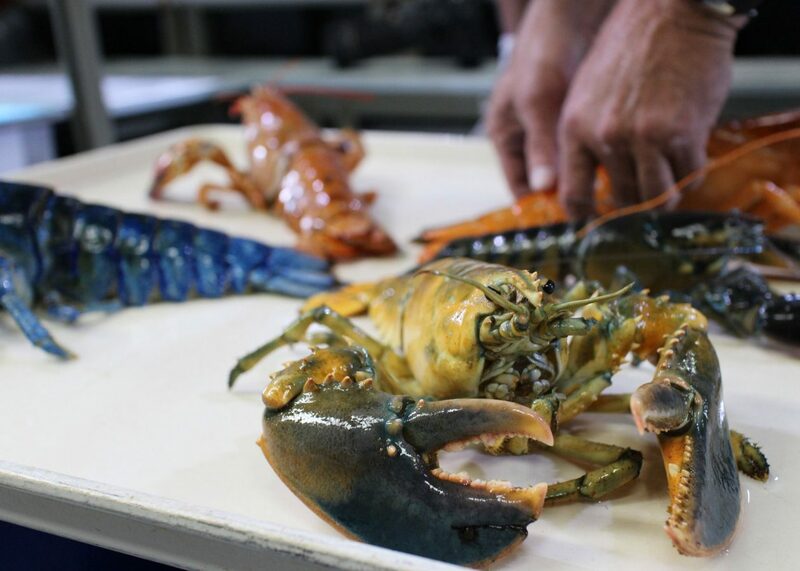 Caught by lobsterman Bill Porter of Marblehead, this pale yellow one joins other oddly colored lobsters, including a blue, orange, and the Aquarium’s Halloween lobster, which is orange on one side and black on the other. 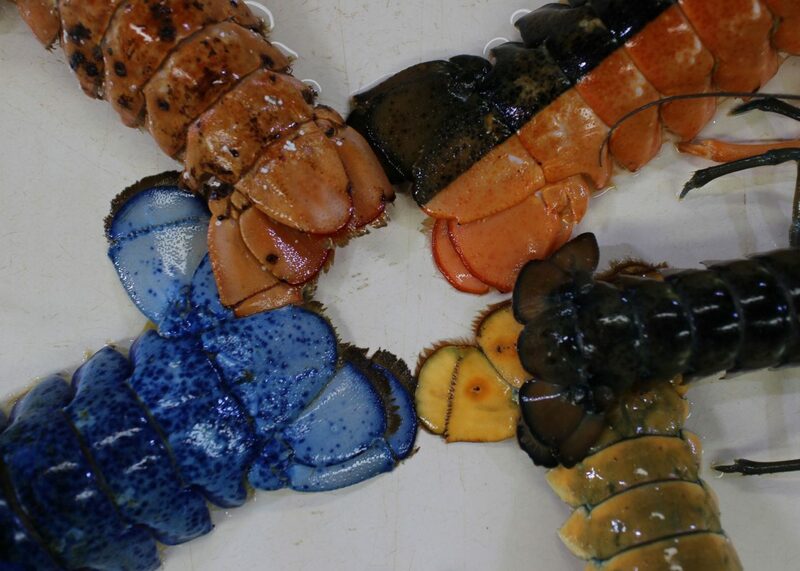 To mark this unusual collection of crustacean color, the Aquarium assembled the beautiful crustaceans for a photo op. Being somewhat crabby by nature, the lobsters faced outward from the circle so as not to antagonize each other. Yellow lobsters have been estimated to have an incidence of 1 in 30 million in the wild. This crustacean will not be on exhibit for at least a month as it under goes quarantine, but other oddly colored lobsters can be found at the Aquarium hiding in the rocks among the exhibits of the Northern Waters gallery and being displayed during live animal presentations for younger visitors. Today’s photo op featured a blue, orange, split, and common lobster along with the new yellow beauty. As you can see, American lobsters are usually a mottled greenish brown. Once cooked, they become the familiar bright red that are served to diners around the world. Take a look and compare for yourself! 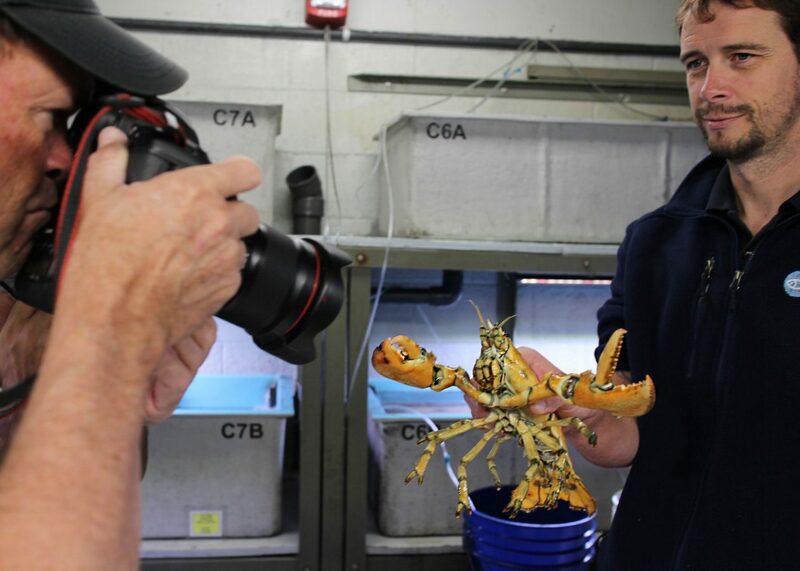 Aquarist Bill Murphy shows off the new arrival — a rare yellow lobster. The yellow lobster joins several other uniquely colored lobsters at the Aquarium. The full array includes, clockwise from bottom left, blue, orange, split, traditional, and yellow. The Aquarium has been lucky to provide a home for many colorful lobsters. Click through the links below to learn more about these colorations and see pictures of these beautiful animals.